A city in Northern Syria, once a refuge for those fleeing the fighting all around them, is now the scene of suffering and death. Afrin is a Kurdish city, but it has welcomed Christian and Yazidi refugees fleeing the Syrian civil war. "Afrin was untouched by the war going on around us," Valentine Hanan, a resident of Afrin said. "We were a safe place in the middle of a war-torn nation." 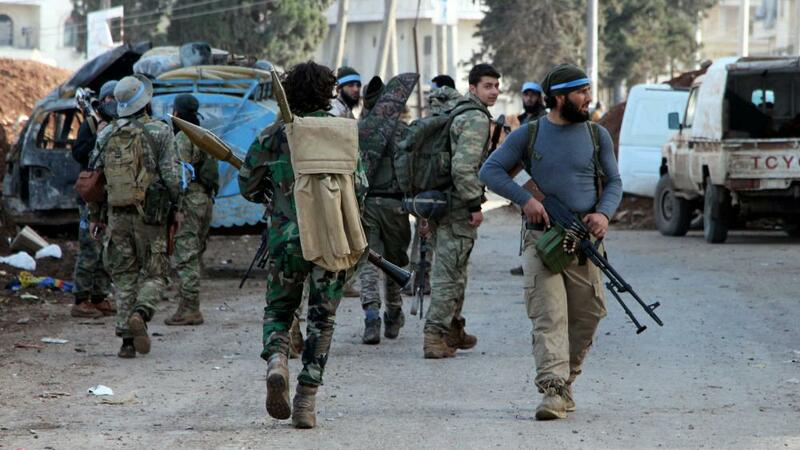 That all changed January 20, 2018, when Turkey, backed by Syrian rebels, started moving troops towards the north-western Syrian Kurdish enclave. Now, Turkey controls the city and says it won't leave. "I am very grieved about what is going on today," Hanan said. Hanan is a Syrian Kurdish Christian and fears Turkey's invasion of Afrin is a huge blow to Syria's Kurdish community, in particular those who converted from Islam to Christianity. "6 years ago when I started the church in Afrin, I didn't know of any other Christian," Hanan said. Now some 230 people attend his Church in Afrin. "Many of those who come to church are from Muslim background and they became Christians," Hanan said. He says eight years of a grinding civil war drove residents to the church in search of peace. "Many people were coming to the church because they were interested in knowing more about Christ," Hanan said. Several families from the church fled the town just before the Turkish troops entered. Many of the other Christian families are still in Afrin and are now trying to get out." Hanan has serious concerns whether the takeover will lead to the ethnic cleansing of Kurds from the region. Just before the invasion, Syrian rebels who led the assault on Afrin, reportedly posted a video online threatening to kill Kurds in Afrin unless they converted to Islam. "By Allah, if you repent and come back to Allah, then know that you are our brothers," a soldier in the video said. "But if you refuse, then we see that your heads are ripe, and that it is time for us to pluck them." Such declarations have Hanan and other Syrian Christians extremely worried about their future in Afrin. "Now they are afraid that they could be persecuted for their faith. Many are terrified for their lives because Islamic groups are moving around the town." The British-based Syrian Observatory for Human Rights said at least 200,000 Afrinians were displaced to areas near the town. Turkey's president, Recep Tayyip Erdogan, says his troops plan to expand military operations into other Kurdish-controlled territory in Syria. "The situation in our town is very hard," said Hanan. We are ones who want to see God move in the Near East and are praying for the people and cities in Lebanon, Jordan, Syria and Iraq.